President Rodrigo Duterte, for all his posturing and promises, has so far done nothing substantial to curb forced migration, something that he promised to make “optional and not a necessity” when he assumed office. Instead, what we have seen thus far is a rehash of the same neoliberal policy of labor export when it comes to peddling Filipinos’ cheap and docile labor to the global market. Pres. Duterte’s earlier promise to end contractualization by yearend 2016 was widely welcomed even by OFWs because it brought hope of them coming home to decent-paying regular jobs. However, this promise is yet to be fulfilled. In light of the continuing crisis in the Middle East and looming mass deportations of undocumented migrants in the USA and Europe, OFWs are expected to return to the country only to be forcibly driven away again to seek jobs despite risky conditions abroad. Independent think-tank IBON Foundation estimates that there are still 11.5 million Filipinos who are without work or still looking for more work because of the poor quality of jobs. There were 24.4 million citizens in low-paying and insecure work with little or no benefits in 2016. The most recent Department of Labor and Employment’s (DOLE) Order 174 has been exposed to even fortify the practice of contractualization rather than end it. With the passage of DO 174-2017, packaged as the government’s solution to workers’ problems, contractualization is legalized, aggravating the already rampant problem of labor flexibilization, depressed wages, and, ultimately, more massive unemployment. Widespread unemployment and contractualization are root causes of forced migration. Fewer Filipinos were jobless in the first quarter of 2017 compared to 2016, but Filipino optimism on job prospects went down as well, a Social Weather Stations (SWS) survey revealed. According to Trading Economics, a New York-based global economics research institute, unemployment rate in the Philippines rose to 6.6 percent in the first quarter of 2017, from 4.7 percent in the December quarter. This is the highest jobless rate since March 2015. The gap between the rich and the poor has further widened, with the income of the top 1% of families equivalent to that of the bottom 30% of households (IBON). According to Forbes, 13 of the richest Filipinos made it to its top billionaires of the world in March 2017. It is in this light that Migrante International fully supports workers’ demand for a P750 national minimum wage. A P750 national minimum wage can significantly reverse the migration of OFWs. If implemented, for every year, around 200,000 workers can opt to stay and contribute their labor and skills to nation-building while living decently with their families. 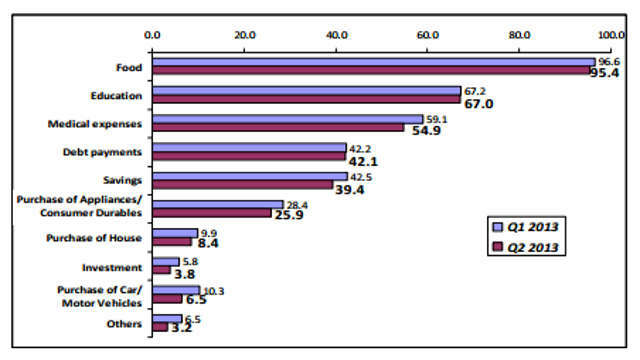 Based on Migrante’s study, OFWs who receive a basic salary of USD$400-500 per month would prefer to work in the Philippines instead because their income will be at par with the pay they receive abroad. Data from the Philippine Overseas Employment Administration (POEA) shows that since 2011 the country has been annually deploying at least 200,000 OFWs to job positions with salaries ranging from USD$400-500 per month. Majority are household service workers and general laborers in the Middle East who receive monthly salaries of USD$400 1,500 Saudi riyals, respectively. According to 2015 data from the PSA, these OFWs account for 33 percent of the total OFW deployment. Meanwhile, OFWs are coming back home in droves not because they choose to but because of the effects of an ongoing global economic crisis in host countries. Hundreds of thousands of OFWs are being displaced and retrenched in Saudi Arabia and the Middle East. What awaits them in the event of their emergency return? Definitely there are not enough decent-paying domestic jobs available. What the Duterte government offers are mere dole-outs and band-aid solutions that are not long-term solutions to unemployment, low wages and lack of social services. The government’s response to the ongoing crisis in Saudi Arabia is testament to the continuing bankrupty of the Philippines’ labor export policy. Last July 2016, Department of Labor and Employment (DOLE) Sec. Silvestre Bello III promised to resolve the issue of stranded OFWs in Saudi Arabia by yearend. Now, a year since, what has the government done so far in response to their plight? Sec. Bello, in the same press conference, announced that the OFWs opting to transfer to other companies “made it easier for us (the government)”, but he also admitted that the OFWs have not yet been paid their withheld wages and necessary money claims. These statements are not only contradictory but treacherous on the part of the government. On one hand, while efforts of relief operations and on-site assistance should be lauded, these are short-term and band-aid solutions that do nothing to address the major issues of emergency repatriation, labor issues and comprehensive reintegration for affected OFWs and their families. Government efforts have also been fragmented, with various agencies involved, particularly the DOLE and Department of Foregin Affairs (DFA), “one-upping” each other in terms of who played a command role in the government’s humanitarian mission to Saudi Arabia. Migrante’s sources in the DFA claim that after the initial and only press conference, where Sec. Bello and DFA’s Perfecto Yasay publicly flanked Pres. Duterte as he welcomed a handful of repatriated OFWs from Saudi, the labor secretary had been reluctant to conduct a follow-up humanitarian mission after he first one in July. Thus begging the question: Was the DOLE’s objective in the government’s humanitarian mission to Saudi Arabia not really for the main purpose of repatriating stranded OFWs but conducting damage-control for the beleaguered Saudi companies and local recruitment agencies through the facilitation of job transfers? If so, the promise to “end the Saudi stranded crisis” by yearend 2016 was misleading and bound to fail from the start. Job transfers of crisis-ridden OFWs have been the thrust of the previous governments – as in the case of the MMG workers who initially called for emergency mass repatriation in 2014, were convinced by the PH government to be transferred to other companies, only to enlist yet again for repatration in 2015 after the company they transferred too was also affected by the Saudi crisis. If Sec. Bello worked mainly to facilitate job transfers, then he only succeeded in buying time for and “rescuing” the companies and local private recruitment agencies instead of the affected OFWs. This is unsurprisingly in line with DO 174 and other deceiving, pro-capitalist and anti-labor policies that the DOLE has been advocating thus far. Meanwhile, the crisis in Saudi and the Middle East continue to worsen. OFWs, those who Sec. Bello said “opted” to stay on, have not become impervious to the crisis just because they were transferred to different companies. The crisis is also now affecting not only OFWs in industrial and construction sites but those in the service and health sectors as well. The Duterte government, however, now appears to deem the Saudi crisis fait accompli, problem-solved, and therefore business-as-usual between the Philippine government and its biggest OFW labor importer. Remittances from OFWs remain at record-high despite the global economic crisis, reaching a record-high USD$26.9 billion in 2016 and accounting for 10 percent of the country’s Domestic Product (GDP). However, although annual remittances increased, its growth rate has been decreasing in recent years. The continuing decrease in growth rate is a constant worry for the Philippine government. If the trend continues, as it is expected to, the governent will be in big trouble because it relies mainly on remittances for its foreign exchange revenues. This explains the Duterte administration’s thrust to further to seek job markets abroad and intensify its labor export program. Through remittances, the government earns exponentially without having to shell out much capital investment. Even funds for labor export management through agencies sucha as the POEA or the Overseas Workers Welfare Administration (OWWA) are directly sourced from OFWs or recruitment agencies and employers through an assortment of fees. Duterte, while mouthing local job generation as the government’s core program to eliminate forced migration, continues to hail the “bagong bayani” and their “contribution to the economy” to further promote labor export. To do this, he has become more aggressive and active in lobbying for job markets and signing of bilateral agreements with host countries in the past year though numerous state visits. Aside from remittances, labor export also provides a tempting alternative to the unemployed and underemployed. Through it, the government insulates itself from its responsibility to create local regular jobs that offer decent wages. Instead, it becomes more convenient to evade genuine and strategic policy reforms to turn the economy around. The country’s economic situation has not improved under Duterte’s rehashed neoliberal economic policies. Duterte’s “10-point economic agenda” still relies heavily on foreign investment, debt and export-dependence, particularly the dependence on the export Filipinos’ cheap labor in exchange for remittances. With regard foreign policies and relations affecting our OFWs and Filipinos overseas, Duterte’s statement that he “will not lift a finger” to help the almost one million undocumented Filipino e/migrants in the US under threat of mass deportation due to US Pres. Trump’s anti-migrant program is very telling of his overall attitude and policy. According to the Department of Foreign Affairs (DFA), there are currently 3.4 million Filipinos in the US, second only to Saudi Arabia in terms of Filipino populace. Of the 3.4 million, close to one million are undocumented and vulnerable to Trump’s repressive crackdown. It is the government’s duty to assist Filipinos abroad, regardless of their status. Do we turn our backs on them when they direly need the help of their government? Should any harm befall them in the US, Duterte will be to blame if he continues to tolerate and support Trump’s neo-fascism. The Duterte government’s position calling on all undocumented Filipinos in the US to “just come home” is also a very insensitive stance. Like all other OFWs, they were forced to seek so-called better pastures in the US (or elsewhere in the world) due to widespread joblessness, contractualization and low wages, landlessness and lack of basic social services. Over the years, OFWs in conflict-ridden areas have opted to stay and risk their lives and welfare because they know that no jobs await them in the Philippines. The plight of OFWs against racism, xenophobia, rights violations and fascism in host countries is also a very important agenda in the peace talks between the Philippine government and the National Democratic Front of the Philippines. Unfortunately, the Duterte government has withdrawn from the 5th round of formal negotiations. The economic compulsion for the government to keep exporting Filipinos to maintain or especially to increase remittances unfortunately overrides and precludes undertaking any measures that (i.e. OEC partial abolition, extension of passport validity, stopping of “tanim-bala” scheme, etc. ), directly or indirectly, constrict the ﬂow of migration – even if such measures would immediately prevent the incidence of abuses and migrant rights violations. Migrante therefore sees and appreciates the rationale behind Duterte’s proposal of establishing a “Department of OFWs (DOFW)” that seeks to systematize, consolidate and strengthen government efforts to protect our OFWs. This proposal in itself is already an initial critique of the performance of the above-mentioned government agencies over the years. Migrante, however, forwards serious apprehensions on the basis of its assessment of the performances of existing agencies concerned with dealing with OFW services and welfare. If a DOFW is to be established, it is imperative that the Duterte administration first thoroughly investigates how current concerned agencies, as well as existing laws and policies, benefited or failed our OFWs and their families. Duterte’s proposal to create a DOFW should not work to merely further institutionalize labor export, but instead address the decades-long clamor of OFWs and their families to put an end to it. Filipinos are being forced to migrate because of desperation as a result out of the economy’s lack of development resulting in job loss, low wages and lack of livelihood at home. OFWs have borne witness to how insincere, insensitive and inept past governments have been in upholding and securing the protection and welfare of OFWs. The past four decades of Philippine labor export has showcased a more blatant and unapologetic policy that continues to exploit OFWs’ cheap labor and foreign remittances in accordance to neoliberal interests and dictates. Migrante can only be compelled to support the formation of a DOFW if, and only if, it would work towards the eventual irrelevance of such a department and instead strive for a society in which families do not need to be torn apart just to survive. Unless Pres. Duterte makes good his promise to address the root causes of forced migration, it will be a never-ending and chronic cycle for OFWs and their families. If Duterte sincerely wants our OFWs to come back home, we need more regular jobs, higher wages and pro-labor policies, not a labor export policy that has long gone bankrupt. To genuinely address the problem of forced migration, economic policies should focus on developing the national economy by advancing local industries, agriculture and basic services. 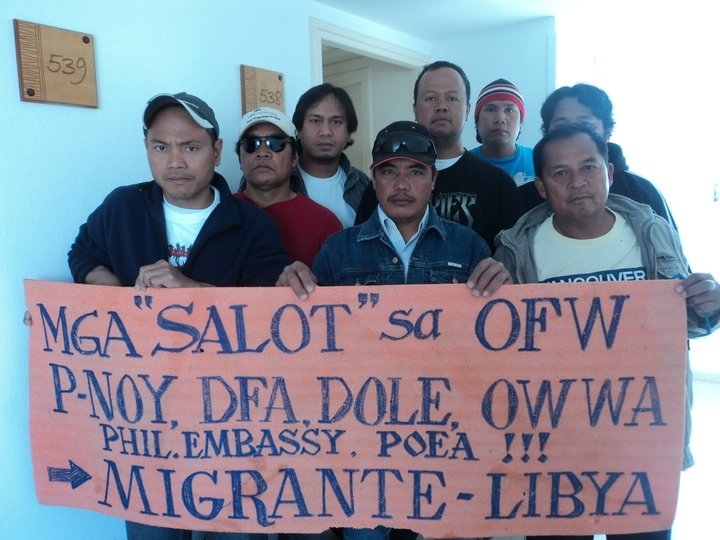 Global alliance of overseas Filipinos Migrante International today slammed Pres. Benigno Aquino’s seemingly “doomsday” statement on the upcoming Papal visit. “It is as if instead of a joyous affair, the President and Malacanang are expecting chaos to ensue. 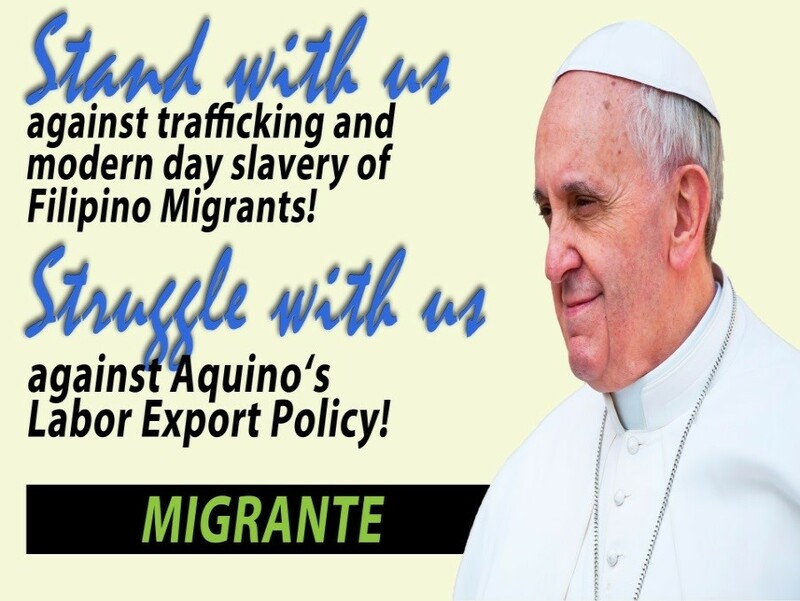 This is not a very welcoming message to the Pope and it sends a message to the international community that the Filipino people are nothing but an unruly bunch,” said Garry Martinez, Migrante International chairperson. Martinez said that Aquino may also be pre-empting expected activities appealing to the Pope to heed the cries of the poor and oppressed Filipino people against wrongdoings in government. Martinez said Aquino “is nothing like the Pope who is much-loved by the Filipino people”.